Jantel Lavender goes up for two of her 20 points in semifinal game two. She was 10-11 shooting. Photo by Benita West/T.G.Sportstv1. Los Angeles, Calif. – With high energy and quick ball movement, the Los Angeles Sparks again dominated the Chicago Sky Friday in the WNBA semifinals, 99-84. They are 2-0 in the series and could punch a ticket to the Finals with a win Sunday. 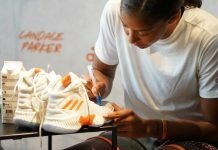 Candace Parker had 20 points, 12 rebounds and eight assists for the Sparks, and Jantel Lavender added 20 on 10-11 shooting. Three other Los Angeles players were also in double figures. As in game one, the Sparks heated up midway through the first quarter, taking the lead for good at the 5:33 mark. Chicago had six players in double digits and outscored their hosts in the paint. But they shot only 38 percent on the night, struggling since losing top scorer Elena Delle Donne to a thumb injury before the playoffs. Los Angeles coach Brian Agler credited the Sky, and said his team has to shore up their turnover margin. 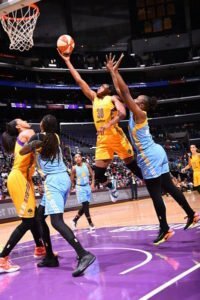 Nneka Ogwumike, who had 18 points for the Sparks, was crowned the league’s regular-season MVP Wednesday. The same night, Lavender was presented the Sixth Woman honor. Both Ogwumike and Parker – a two-time MVP herself – had high praise for their teammate. “Jantel is down to do whatever,” Ogwumike said. “She’ll set a screen, run, rebound, box out-anything. She’s that front court push that really helps us continue with the flow of our game and then when she comes in as well, we’re able to integrate our big line up, which really adds to the dimension of our team. 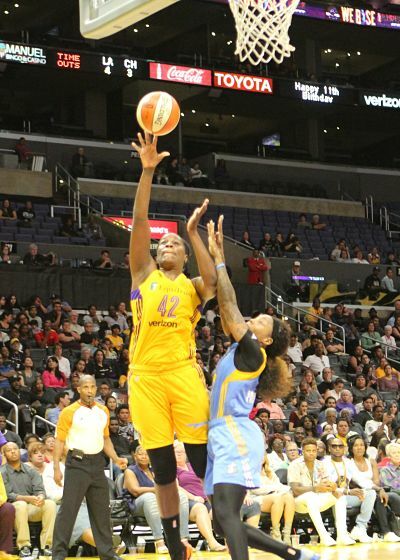 Nneka Ogwumike goes to the basket against the Chicago Sky. Photo by Juan Ocampo/NBAE via Getty Images. The Sparks are seeing their first return to the Finals since 2008, Parker’s rookie year. Parker said she was cognizant of each year she and teammates have had to discuss post-game playoff losses since then. Parker reiterated a team theme this season, focusing on details and attacking one game at a time. After a post-Olympic break slump, Los Angeles looks like they did earlier in the season. Ogwumike said it’s all about poise. And she said the Sparks are still figuring things out. Parker acknowledged Los Angeles has had a bit of a chip on their shoulders this season. The Sparks head to Chicago for a 3 p.m. Eastern showdown on ESPN. The year-round sports backlash has begun?